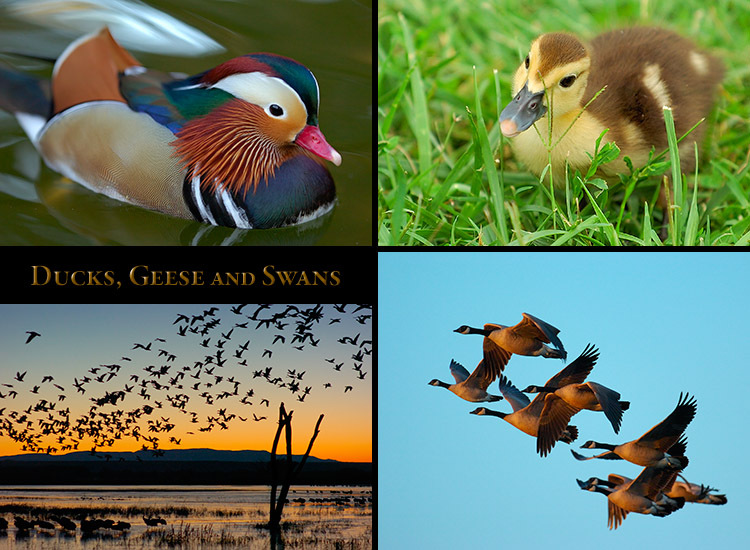 The Ducks, Geese and Swans Wildlife Study is a compilation portfolio housing over 675 images. 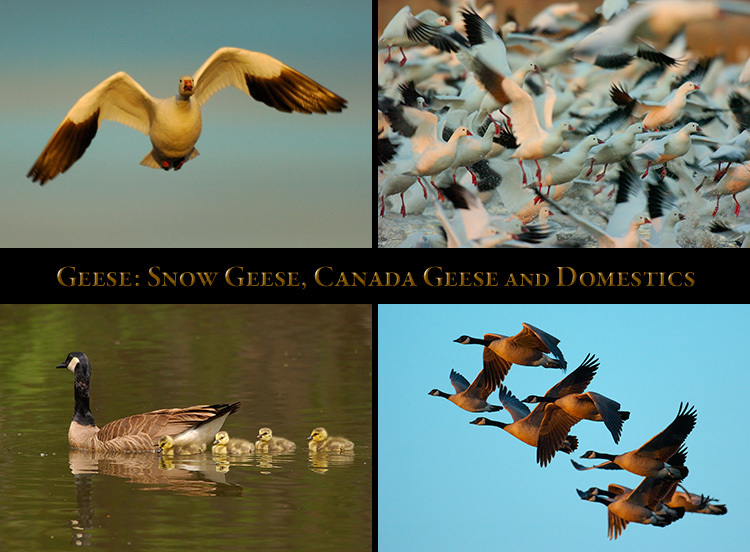 extensive six page section on Snow Geese, and a page on Canada Geese and Domestic Geese. 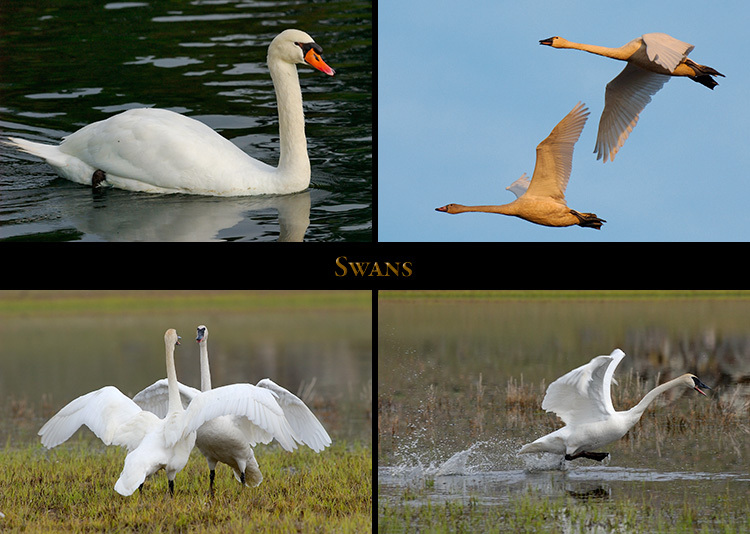 The Swans page displays 57 images of Mute Swans, Trumpeter Swans and Tundra Swans. 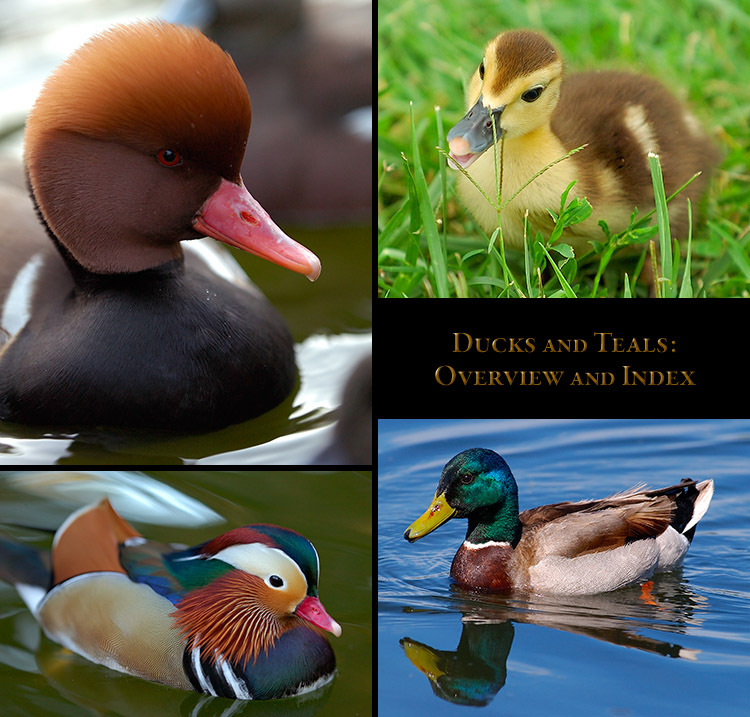 This Index page contains display composites with links to section Overviews and pages. the captions and other material, it has been temporarily uploaded with images only. 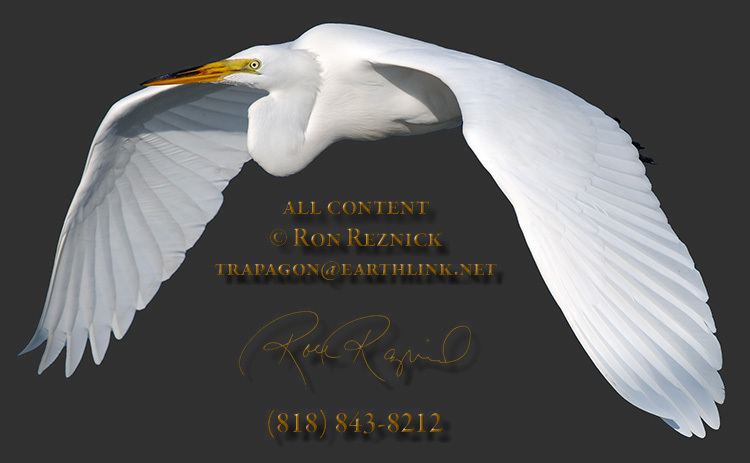 The Banner below leads to the Birds Collection page where a Gallery can be selected. 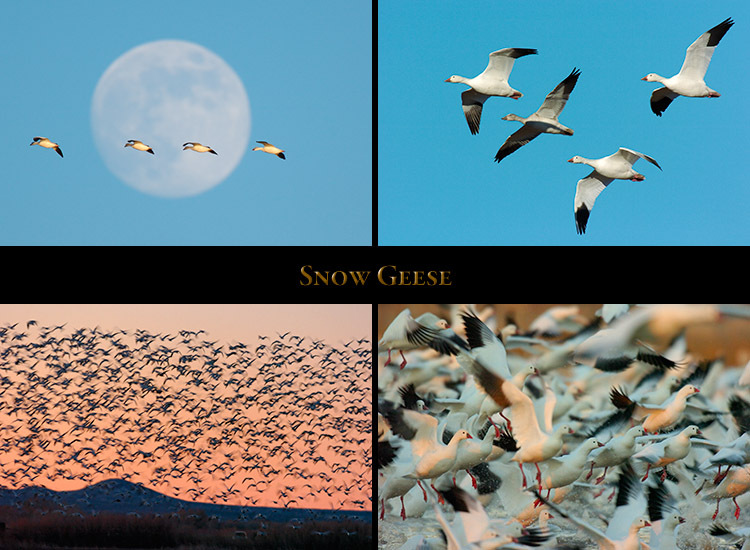 several year period at wildlife refuges in California, New Mexico, Alaska, British Columbia and Japan. The Overview contains sample images and linked Display Composites from each of the five section pages. of Pekin Ducks) taken at several wildlife refuges in California, New Mexico and British Columbia. 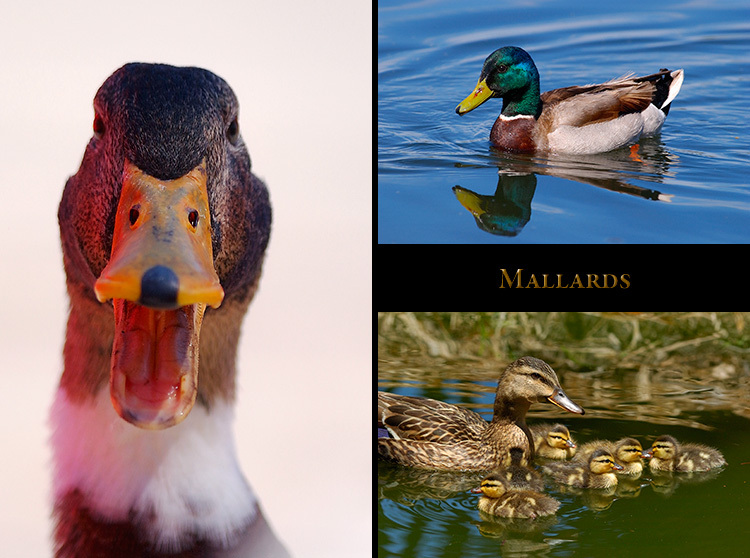 Mallards are a widespread dabbling duck which were ancestral to most breeds of domestic ducks. 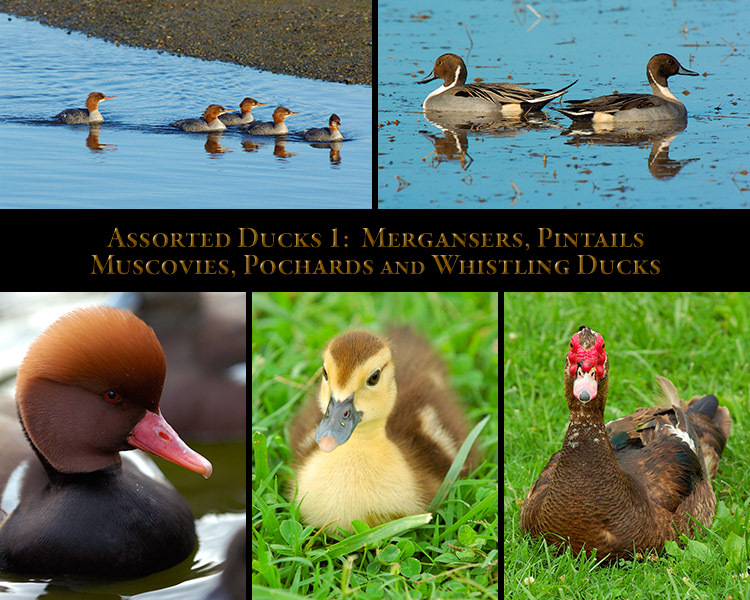 They frequently interbreed with closely related ducks in the genus Anas, resulting in fertile hybrids. 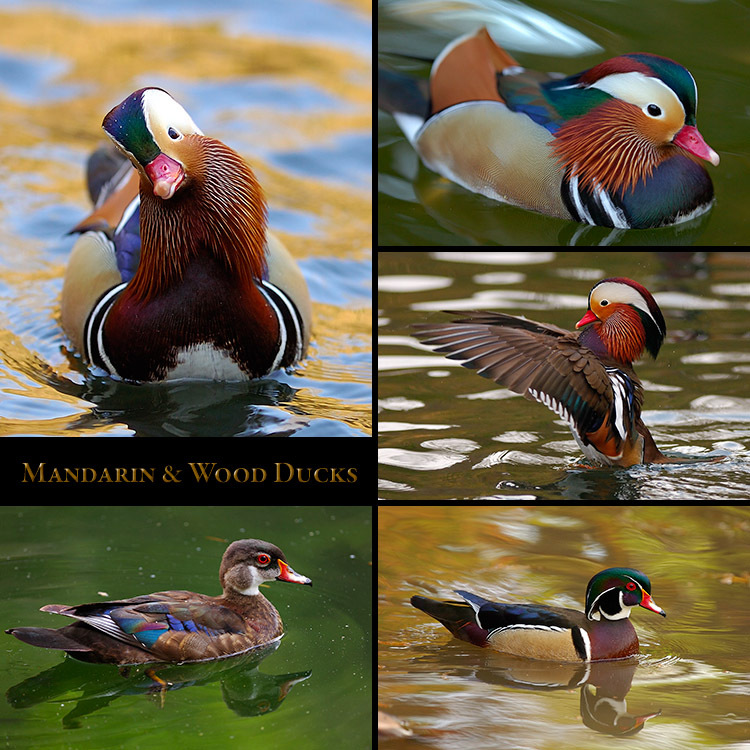 The Mandarin and Wood Duck page contains 41 images of these exceptionally attractive perching ducks. Mandarin and Wood Duck are very similar. Occasionally mixed pairs are encountered in the wild. 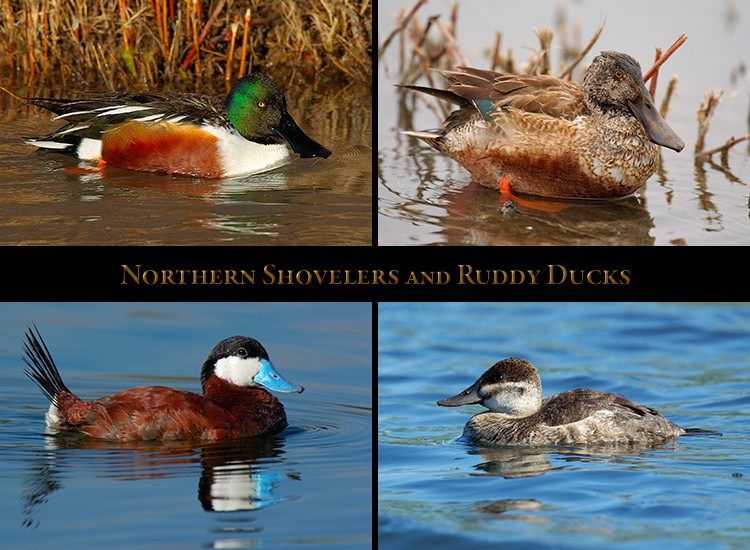 The Northern Shoveler and Ruddy Duck page contains 57 images of these distinctive ducks. 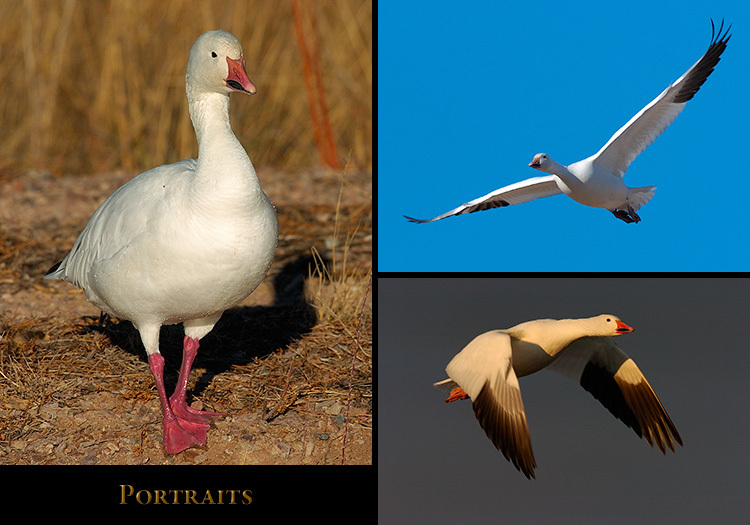 breeding male has a distinctive blue bill, white cheeks and a black crown on a rust-red body. Males have a very entertaining display behavior, detailed in several images on this page. 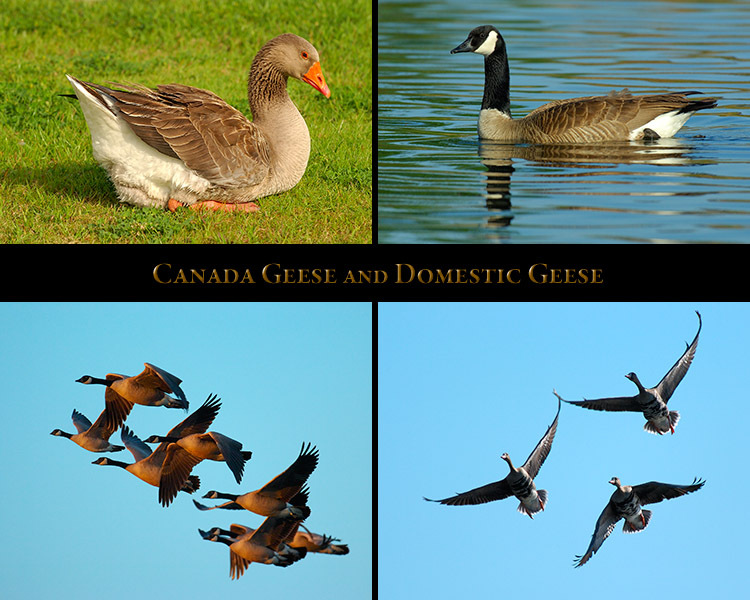 and they are all unrelated species which are grouped on this page for the purposes of display. 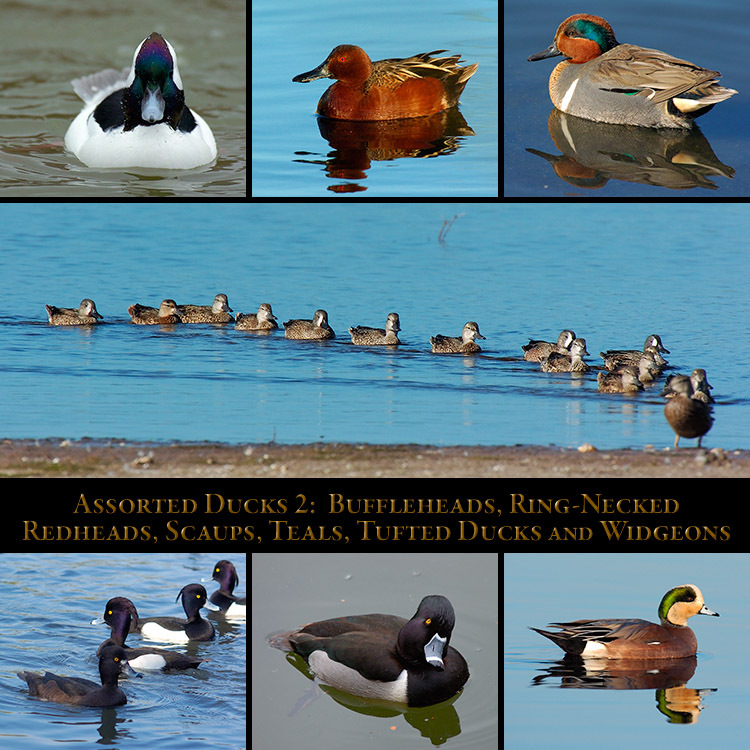 Ring-Necked Ducks, Redheads, Lesser Scaups, three types of Teals, Tufted Ducks and Widgeons. in the genera Anas and Aythya, and are grouped on this page for the purposes of display. their arctic mating grounds. Their mass flyouts in the morning are spectacular. 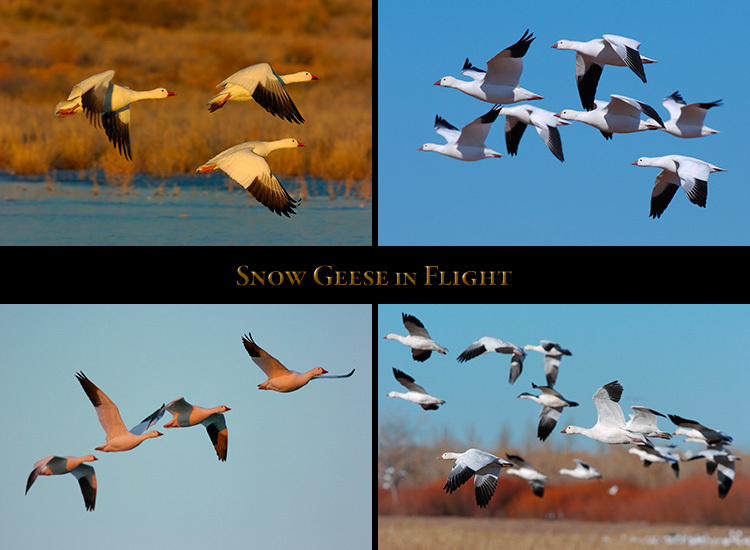 Flock Scenes, Group Portraits and Flight Flurries; and Snow Goose Scenics. section pages, and display composites which link to the section page. 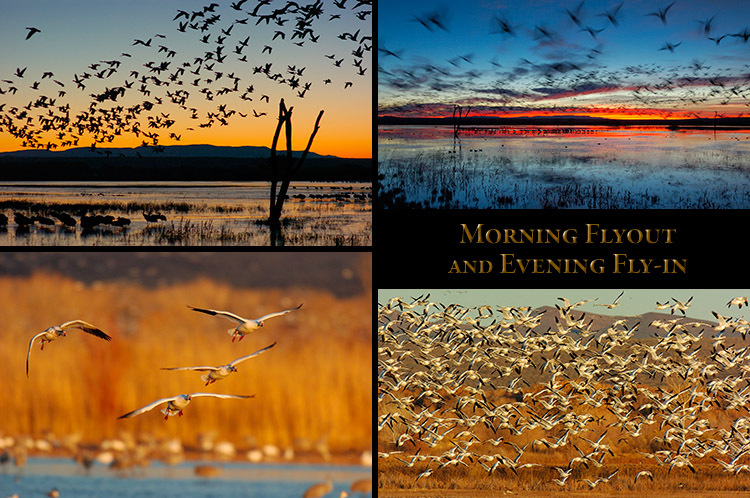 Flight Studies, Snow Goose flurries at dawn and sunrise, and sunset fly-in. close flight portraits, and Flight Studies taken between sunrise and mid-day. 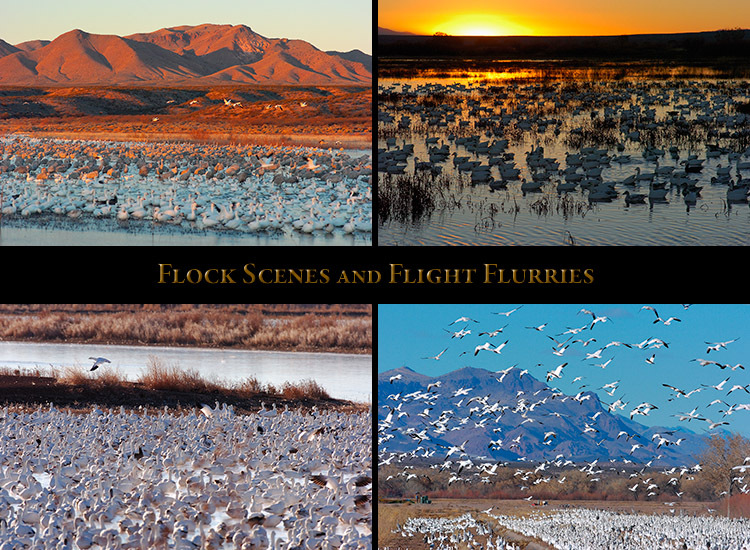 burst away from their overnight sanctuary as one, covering the sky in a honking horde. at mid-day, and flying back into their sanctuary in the ponds from the farm fields at sunset. 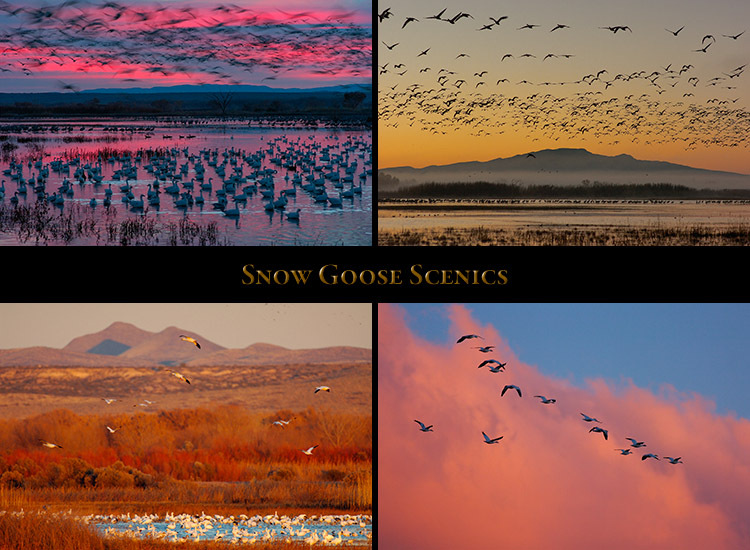 66 images of Snow Geese enhancing the New Mexico scenery at dawn and sunset. Baylands Nature Preserve in Palo Alto, CA, and Graylag and Swan Geese from the LA Arboretum. the Mating Display of the Trumpeter Swans, taken at Trout Lake in Yellowstone National Park.